The New Music Makers have a concert coming up on Friday 5th June at the Berry Theatre in Hedge End. The New Music Makers practice their singing in Hedge End Methodist Church on a Thursday Evening. 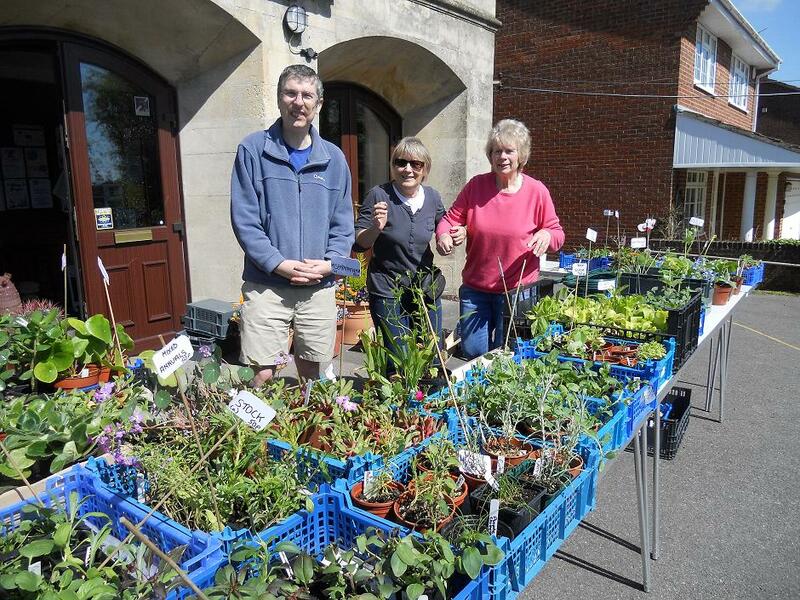 On Saturday 2nd May we held our Jigsaw Puzzle Festival and Plant Sale. This event was attended by well over a hundred people some of whom had travelled to be with us for the occasion and some Hedge End regulars. We sold over 150 of the ready assembled jigsaws and several hundred plants. No doubt many of the people who have been preparing for this event for months are pleased to have space in there homes and garages again. Many People took the opportunity to catch up with their friends while eating the cakes and ploughmans lunches that were available on the day. Our Thanks to the Village Hall and the United Reform Church for kindly lending us the extra tables needed. Our Thanks also to all those people who helped in any way to make this event possible. Many people asked if we would be holding another Jigsaw Festival in the future; this decision has not yet been made, but watch this space. In the meantime we are looking forward to our Autumn fayre which will be held on the 17th October. Please note that for various reasons a decision was made in 2018 to disband the Football teams. Our thanks to everyone whom has made the teams possible over the years. Since 2009 Hedge End Methodist Church has had two football teams who complete in the Solent Churches League. They are known as Hedge End Methodist Reds and Hedge End Methodist Blues. The Solent Churches League has been described as “Church teams whose aims are to use football as a tool to share the Christian message with others”. There is no requirement for players to be practicising Christians or religious but they are required to fully respect the faith and abide by the league and Club rules. We are pleased to report that the Blue Team has gone through the whole season without losing a Match. The Team hopes to continue its success by beating Leigh Park in the League Cup final which will be played on 16th May. 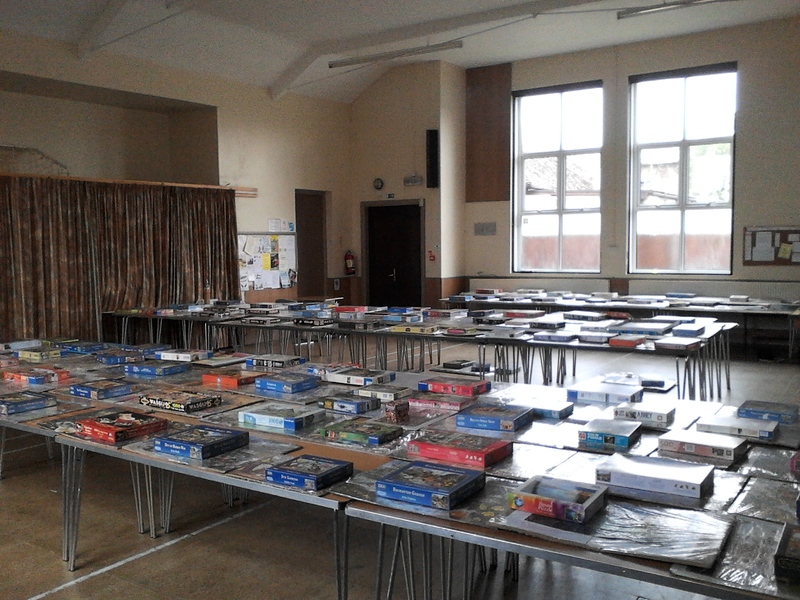 On Saturday 2nd May from 10 a.m. to 4 p.m. we will be holding a JIGSAW PUZZLE FESTIVAL AND PLANT SALE There will be an Admission charge of 50p which will give you access to hundreds of Jigsaws to View and Purchase, of several different sizes up to 1000 pieces. The Jigsaws are displayed already made up so you can see all the pieces are there. When you buy one it will be placed in a plastic bag, back into its box. Plants for Sale including,Annuals– many varieties, Perennials,Herbs Veg plants,Tomato hanging baskets and Potted summer flower arrangements. Refreshments available all day including Ploughmans at Lunchtime. On Saturday 11th April from 10.30 to 12.30 we will be holding our Easter Jammy Church. This is an opportunity for everyone to come together for Worship, Crafts, watching a Puppet Show, and Food. 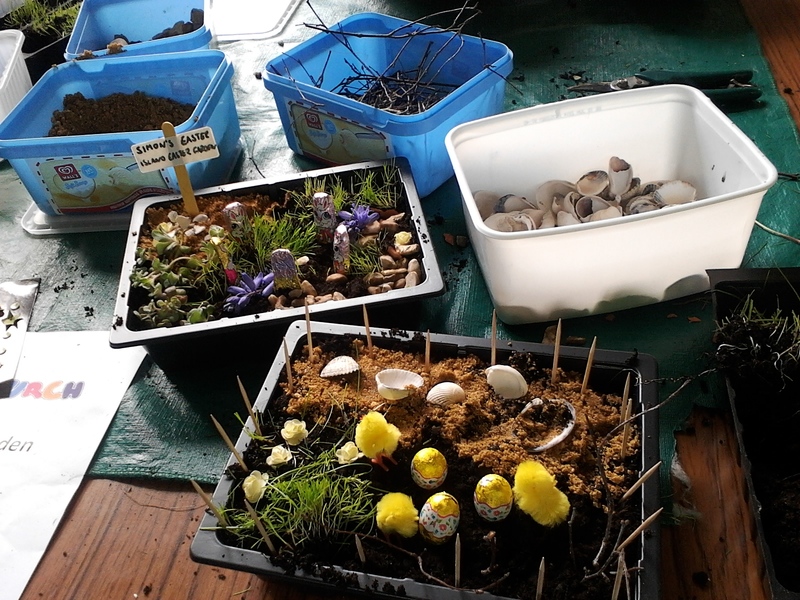 The Picture above shows one of the craft Activitys in 2014 when Easter Gardens were Made. Although the activities are based around families, people of any age are welcome to attend. People are not obliged to stay for the whole session you could just pop in to see what we are up to. More information can be found on the Jammy Church Facebook page. Got Questions about Life ? We are Running “The Alpha Course” at Hedge End Methodist Church. Begins 17th April for 11 Weeks. Starts 18.30 on Fridays in the Church Hall. First a light Meal then a DVD presentation then a short break, then Discussions it will end about 21.00. Christians will always be seeking to know more of him and are still asking questions about him – was he merely a man or is he the Son of God? This course will ask – and attempt to answer – such questions as – “ Is there more to life than this” –“ Who is Jesus?” – “ Why and how do I pray?” – “What about the church?” and many more. This Morning Rev. Geoff Scarlett was interviewed on the Tim Daykin Show on Radio Solent. He was interviewed by Mike Apps and talked of Writing Poems and Hymn Lyrics. This link is to the whole programme if you havent got time to listen to the whole programme if you start to listen at 01.45 on the timeline you will get to the specific piece. Our Thanks to Radio Solent for allowing us to link to their site. Please note this programme will only be available until 29th March. As part of the Tim Daykin Show on Radio Solent this Sunday (1st March) there will be an interview with Rev. Geoffrey Scarlett. He is a retired Church Minister who is very active within Our Church and in the local area. Geoffrey will be talking about writing Poems and Hymn Lyrics. He estimates that he has written approximately 70 Poems and Hymns over the last 30 years. Some of his poems can be found in the blogs posted on January 2nd and January 21st This year. This is the second Radio Solent interview that Geoffrey has been involved in as he was interviewed with Stuart (as part of his Celebration of 50 years playing the organ) in the same show on 1st February. We believe that the interview will be broadcast between 7.00 and 8.00 in the Morning. During our normal service on Palm Sunday ( 29th March) we think of Jesus’s triumphant procession into Jerusalem in a Service taken by Mrs Jan Hayter. This is followed by several events and services the next weekend which is the Easter Bank Holiday Weekend. i.e. between Maundy Thursday (2nd April) and Easter Sunday (5th April). These are detailed below. This will take place at 7.30 on Maundy Thursday (2nd April).The service includes communion. This service will be conducted by Rev. Tony Parkinson. The Organisation “Churches together in Hedge End ” Hold a Walk of Witness at 11.p.m. starting in the Centre of Hedge End. Near the Co-operative store. On Easter Day, we are holding an Easter Breakfast at 8.30 a.m. This will be a light Breakfast including Worship. 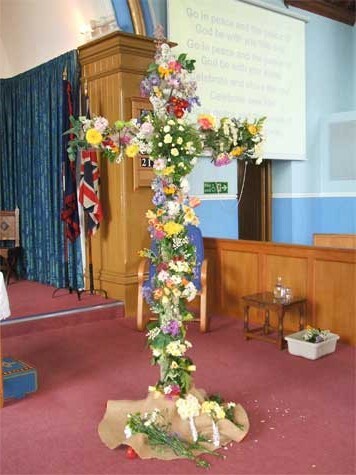 During the Service at 10.30 a.m. on Easter Sunday we will be creating a Floral Easter Cross. This will be similar to one we made in a previous year which is depicted above. If you would like to contribute to this please feel free to bring a few flowers with you to the service. This Service will be conducted by Rev. Arthur Cowburn.